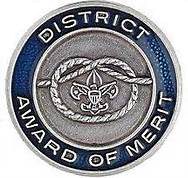 The District Award of Merit is a council award presented by districts in the same manner that the Silver Beaver is a national award presented by councils. The award is available to Scouters who render service of an outstanding nature at the district level. It is not appropriate to nominate a Scouter who has already received this award. A professional Scouter or other council employee may not receive this award based on employment service. However, a professional Scouter or employee who also serves as a volunteer Scouter may be eligible, based on volunteer service. A nominee must be a registered Scouter. A nominee must have rendered noteworthy service to youth in Scouting, outside Scouting, or both. Note: The nature and value of “noteworthy service to youth” may consist of a single plan or decisions that contributed vitally to the lives of large numbers of youth or it may have been given to a small group over an extended period of time. Consideration must be given to the nominee’s Scouting position and the corresponding opportunity to render outstanding service beyond the expectations of that Scouting position. The nominee’s attitude toward and cooperation with the district and/or council is to be taken into consideration.